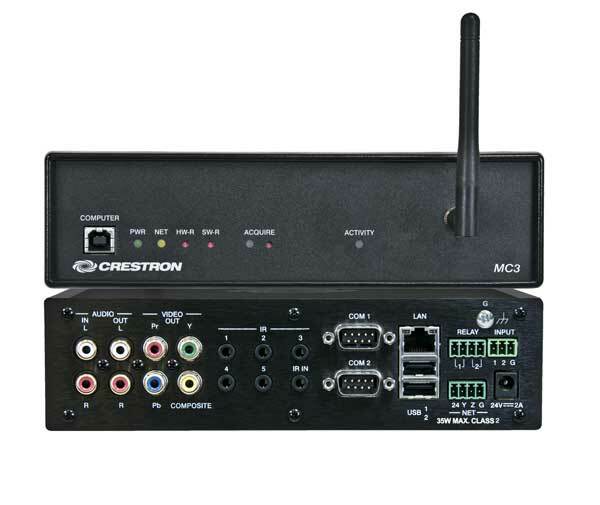 The Crestron MC3 is an economical 3-Series Control System in a compact form factor with built in infiNET EX wireless technology and on-screen display capability. Featuring the 3-Series control engine, the MC3 forms the core of any modern networked home or commercial building, managing and integrating all the disparate technologies throughout the facility to make life easier, greener, more productive, and more enjoyable. Designed for enhanced scalability, the MC3 affords high-speed, real-time multi-tasking to seamlessly run multiple programs simultaneously. This exclusive modular programming architecture lets programmers independently develop and run device-specific programs for AV, lighting, HVAC, security, etc., allowing for the optimization of each program, and allowing changes to be made to one program without affecting the whole. Even as your system grows, processing resources can easily be shifted from one 3-Series processor to another without rewriting any code. The end benefit is dramatically simplified upgradability with minimal downtime, whether implementing changes on site or remotely via the network. IP technology is the heart of 3-Series, so it should be no surprise that its networking abilities are second to none. High-speed Ethernet connectivity enables integration with IP-controllable devices and allows the MC3 to be part of a larger managed control network. Whether residing on a sensitive corporate LAN, a home network, or accessing the Internet through a cable modem, the MC3 provides secure, reliable interconnectivity with IP-enabled touch screens, computers, mobile devices, video displays, Blu-ray Disc? players, media servers, security systems, lighting, HVAC, and other equipment ? whether on premises or across the globe. Years ago, Crestron pioneered the world's first IP-based control system unleashing vast new possibilities for controlling, monitoring, and managing integrated systems over a LAN, WAN, and the Internet. Today, Crestron offers more ways than ever to control your world the way you want. Using a computer, smartphone, tablet, or Smart TV, Crestron lets you control anything in your home or workplace from anywhere in the world. Native to every 3-Series control system, Crestron XPanel technology transforms any laptop or desktop computer into a virtual Crestron touch screen. Crestron control apps deliver the Crestron touch screen experience to iPhone?, iPad?, and Android? devices, letting you safely monitor and control your entire residence or commercial facility using the one device that goes with you everywhere. Even Samsung Smart TV? has a Crestron control app available. Crestron Fusion provides an integrated platform for creating truly smart buildings that save energy, enhance worker productivity, and prolong the life-span of valuable equipment. As part of a complete managed network in a corporate enterprise, college campus, convention center or any other facility, the MC3 works integrally with Fusion RV? Remote Asset Management Software to enable remote scheduling, monitoring, and control of rooms and technology from a central help desk. Fusion EM? Energy Management Software enables organizations to reduce energy consumption by tracking real-time usage and automating control of lighting, shades, and HVAC. Integrated infiNET EX technology provides an extremely easy and cost-effective way to add control of lighting, shades, room temperature, and other functions using the complete line of infiNET EX based wireless products. Adding an infiNET EX remote like the MTX-3 Handheld Wireless Touch Screen or MLX-3 LCD Handheld Wireless Remote enables sophisticated portable control over everything, whether simply watching TV or adjusting whole-house audio distribution, lighting, and climate control in every room. Perfect for existing structures and rentals, infiNET EX affords ultra-reliable 2-way wireless communications throughout a home or business without the need for physical control wiring. 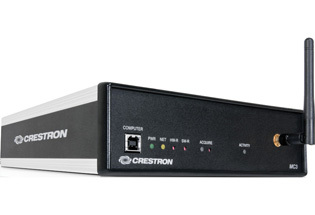 Cresnet provides a dependable network wiring solution for Crestron keypads, lighting controls, thermostats, and other devices that don't require the higher speed of Ethernet or the wireless communication of infiNET EX. The Cresnet bus offers easy wiring and configuration, carrying bidirectional communication and 24VDC power to each device over a simple 4-conductor cable. MC3 OSD Sample ScreenshotsThe MC3 includes the ability to control a home, hotel room, or other facility using just a television screen and a handheld remote. Featuring customizable scrolling menus and full-color icons, the MC3 OSD makes it easy to select any room in the house, pick a music or video source, choose a radio station, TV channel, or media title, and even access lighting, climate, and security system controls. The MC3 OSD provides true-feedback so you always know the status of the item you're controlling. Audio adjustments and lighting levels are clearly indicated using bar graphs. Room temperature and security system status can be viewed and controlled without leaving your favorite seat. Even metadata from your iPod?, ADMS?, or Internet radio tuner can be displayed to show the current playing song, movie, TV program, or radio station. When equipped with the optional CNXRMIRD IR Receiver, the MC3 affords a low-cost IR wireless control solution using any Crestron IR wireless remote or touch screen, or a third-party universal IR remote. In addition to Ethernet, the MC3 includes two bidirectional RS-232 COM ports and five IR ports to interface directly with all of your centralized AV sources, video displays, and other devices. Two programmable relay ports are included for controlling a projection screen, lift, power controller, or other contact-closure actuated equipment. Two digital inputs enable the integration of occupancy sensors, power sensors, door switches, or anything else that provides a dry contact closure or low-voltage logic signal. The MC3 is EMerge Alliance registered and designed to work within a 24 VDC room-level power distribution system. The EMerge Alliance is a not-for-profit open industry association leading the rapid adoption of safe DC power distribution in commercial buildings through the development of EMerge Alliance standards. Crestron is a proud member and supporter of the Alliance. For more information about Crestron Solutions for EMerge Alliance Applications visit: www.crestron.com/emerge. Installer setup via on-screen display, Crestron Toolbox?, or Internet Explorer?